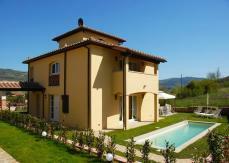 Villa Emerald is a fantastic country property located at the heart of Chianti in Tuscany. 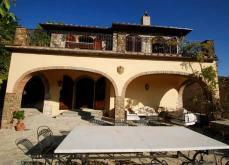 The villa is located amongst thick olive groves and vine yards with a fantastic view on the surrounding hills. â€œWake up in the Tuscan countryside and take an easy 10 minutes walk to the historic piazza of Greve in Chianti for your morning cappuccino and fresh pastry. Restaurants of all kinds, groceries, banks, churches, bus stop etc are all close by at a walkable distance from the villa. This 200sqm villa spreads itself on three levels to accommodate 10 people. The third level is a tower with a panoramic view. 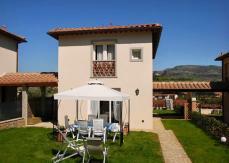 The villa is surrounded by 400 sqm garden and there is also a private parking for 3 cars. First Level: dining-room with furnished kitchen, living-room with satellite-tv, small laundry-room with washing-machine, iron and iron board and one bathroom with wc and shower. Second Level: 3 double bedrooms and 1 twin bedroom each with en suite bathroom with shower. Tower / Third Level: The fifth bedroom is located in the tower on the second floor with fantastic views of Chianti vineyards and olive groves(this bedroom can use the bathroom on the ground floor). The privacy is guaranteed while the villa has its own private garden, swimming pool (9 x 3 meters; 1,30 meters deep), and parking area for up to 3 cars. The name of the House is Emerald because it is mostly green inside. Green has a balancing action and general welfare. The green is the color of nature and it promotes harmony because it has a calming influence on the nervous system. The desire for green lawns and trees that comes after a period of time between the gray stones and red brick of the city is the instinctive yearning for toning the color of nature. Green is peace and refreshment Available on request at no additional costs : baby crib, high-chair, additional bed The villa can be rented out to larger group by matching with the adjacent Villa Sapphire to accomodate upto 15 person.